The Primal World View: Reflections. I have read about the Inuit, the San and African Traditional Religion, the Yoruba, and Mircea Eliada on Shamanism. I studied and then wrote a text book on the religious culture of the Australian Aborigines. Bishop Taylor’s little book The Primal Vision made a deep impact on me as a student at Rhodes and seemed to get so much right. I have also been fascinated by children in my wife’s pre-school. In all these I saw the natural tendency of people in all cultures and from an early age to anthropomorphise or see reality as dominated by personal forces, projecting onto the weather, rocks, plants, animals, fish etc the view that they are shape-shifting and transforming expressions of beings that possess rather human emotions, jealousies, loves, hates and intentions. The play and fantasy life of small children and their use of toys, dressing up and acting out also seem to express this as they treat every doll and toy as if it were alive endowing it with its own personality, though they are quick to draw a distinction between “only playing” – their world – and “the real world” of the adults. Have we moved away from this? Hardly. Sidhattha Gautama, the Buddha, seemed to realise this around 400 BCE. He banned members of his monastic order the Sangha from any involvement in astrology, fortune telling, gambling, sacrifice or magical practice. At the same time he recognised that for ordinary people belief in the power of these things was endemic. The most one could do was make fun of it. Things have not changed. 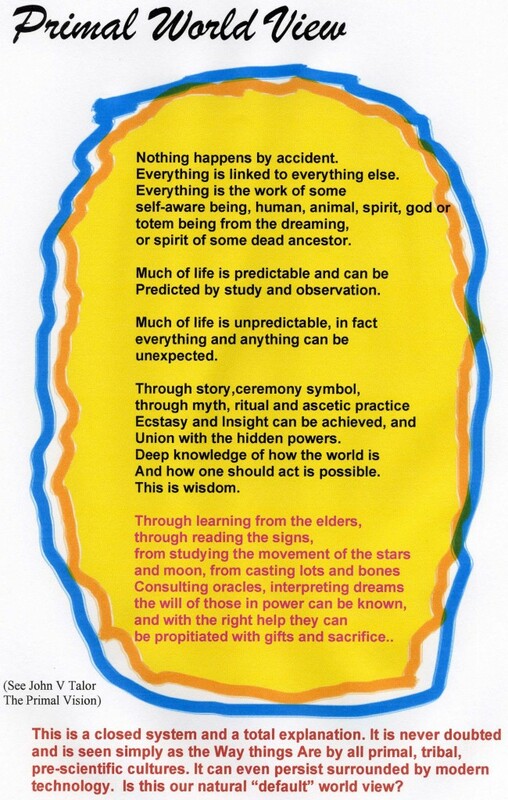 Today in our technologically advanced society, elements of this primal way of thinking remain in what is often referred to as superstition, which is why I suggest it is the default, natural way of thinking for human beings if they are not subjected to the disciplines and mental training which comes with education. Thus we find superstitions regarding numbers, and the continued use of different forms of fortune telling such as palm reading and I Ching abound, and of course astrologers grace the pages of even the “best” women’s magazines. (Remember Nancy Reagan’s astrologer decided what day the President should meet Gorbachev.) The “alternative medicine” sector is vast and profitable and remains a safe haven for all manner or treatment and weird explanation – despite the thin or non-existent evidence they can provide that has scientific credibility as regards their efficacy. People want to believe they are being helped by some vague benign higher power or have access to mysterious knowledge. Secularisation – in the sense of a movement in society away from any formal practice of religion and a rejection of all forms of superstition in favour of what is seen as a rational atheism and independent individualism in the face of an uncaring universe is both accepted by some as liberating and widely rejected by others as too bleak and depressing to live with. They are looking for a warmer, more benign world in which they feel they matter as participants in some cosmic story, and might even be loved by some ultimate mind. In areas such as the South Africa of Jacob Zuma, the power of the ancestors, of witchcraft and traditional healers is taken for granted by “the masses”. It also continues in many of those who may be well-educated as well as those who remain illiterate. African Christianity, particularly where it has gone “indigenous” is often dominated by the persistence of the Primal Vision, by a belief that we live surrounded by hostile or beneficent personal powers or spirits that are ignored at one’s peril. This mixed up world-view where there is a grudging acceptance of the achievements of technology and an enthusiastic take-up of modern gadgetry but which goes alongside a persistent reliance on a primal outlook can be seen, particularly in Africa, to be so powerfully persistent that the “real world” of science, maths, measurement and predictability is not taken too seriously. The outcome then it seems, is that the technology of a modern industrial state and the impersonal impartiality of secular law is given so little respect – even by the powerful elites, that there are power cuts, budgets that do not add up, plans which are ignored, infrastructure that is not maintained, corruption and nepotism on a grand scale and a tendency to put off complex decisions in a general context which can too easily become one of growing political and social disintegration. Is it racist to talk like this? I think not, more I think it is an recognition of the persistence of ancient cultural forms – memes? – to be able to survive despite immense cultural and technological changes in the same society. So primal views survive, but they are broken. Modern Australian Aboriginals cannot resurrect the religious culture of the Dream Time. Nor can the cultures of the Inuit, the San or the Pygmies. In the face of exposure to modern education and technology as an unquestioned way of understanding reality each is finished. The most they can do – as they do – is claim respect for the art, language, and artifacts their ancestors produced, and ownership of the lands the saw themselves as being intimately related to. That essentially it seems is the plight of all those peoples whose remote or hunter-gatherer life-styles or tribal pasts have preserved their primal views in the present world, but the cost of culture clash is catastrophic for most of them. Often this is the result of the prejudice and racism of those who come to rule them – but the descent into alcoholism and dependence is also the result of sinking self-esteem and a loss of perceived status and sense of self worth. In the face of an alien culture that is soon seen by them as overwhelmingly powerful they often are lucky to be treated with “benign neglect” or left alone in a remote area. More often they can be exterminated by force or disease. The primal view thenI would assert is something that underlies the many superficially different and peculiar world views found by all hunter-gatherers, nomads and traditional tribal societies. The first big shift in world-views it seems comes when agriculture becomes established followed by the rise of city states as we now know happened in Mesopotamia, China and Egypt together with specialised social classes and occupations and the development of forms of literacy.